The HRK-7000A combines the features of an auto refractor, auto keratometer, and aberrometer into one, convenient-to-use instrument. Unlike many conventional diagnostic devices, the HRK-7000A generates a Hartmann-Shack based Acuity Map (Zernike Map) that details the refractive errors topographically according to the degree of aberrations. With the ability to map aberrations, you can take your everyday patient care to the next level. The HRK-7000A model also features auto-tracking and a virtual comparison function. Hartmann-Schack: The HRK-7000A is engineered according to the Hartmann-Shack wavefront measurement technique, which is widely preferred for its speed and repeatability. In the HR-7000 A, high resolution is achieved using a micro lenslet array, which was developed by Huvitz. Retro-Illumination Mode: The Retro-Illumination Imaging capability in the HRK-7000A is very helpful in determining ocular health. You can check for scratches and other corneal damage as well as check for lens abnormalities such as cataract. Graphical Display of Refraction Map: The graphical display of refraction errors enhances understanding and reliability. Peripheral Keratometry Measurement: The HRK-7000A provides peripheral keratometry measurements that will aid in contact lens fittings. Pupil and Iris Size Measurements: By freezing an image, you can easily measure pupillary and corneal diameters. IOL Measuring Mode: Patients presenting with cataract or IOL won't present a challenge with the HRK-7000. Now you can gather a wealth of information and take measurements on patients who have intraocular lens implants. Auto Tracking: Using cutting-edge auto sensing and a three-dimensional movement mechanism, the HRK-7000A automatically aligns and focuses. Motorized Chinrest: Set the height of measuring point simply with the push of a button. Animated Guide: If a measuring focus is out of auto tracking range, an animated on-screen guide shows you exactly how to move the joystick to achieve alignment for proper focus. Virtual Comparison Function: With the HRK-7000A patients can compare the current, uncorrected view with the view corrected by AR measurement. 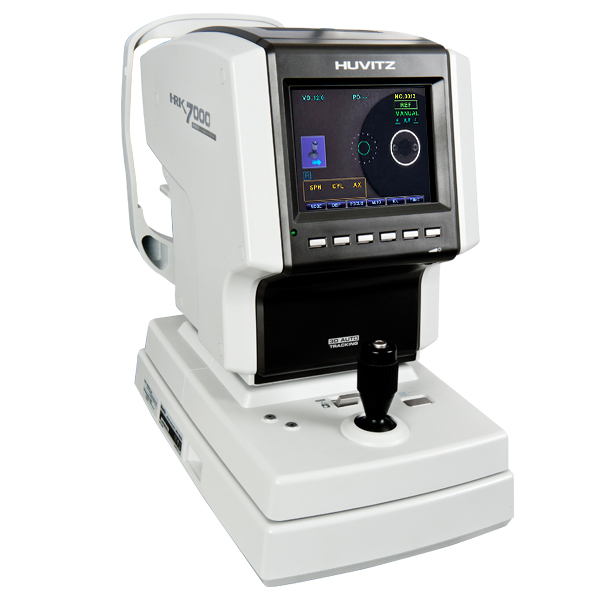 Click the button below to add the Huvitz HRK-7000 A Autorefractor Keratometer to your wish list.